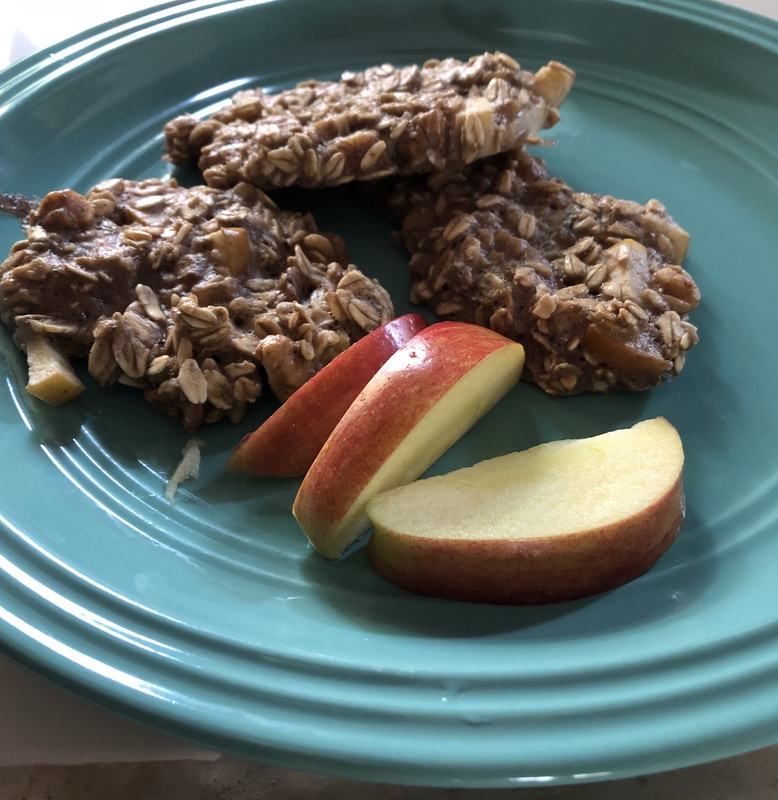 Whole Food Banana Apple Oatmeal Breakfast “Cookies” – What's for dinner, Doc? I wanted a warm breakfast treat using only ingredients in my BrightLine food plan. I committed to eat oats, an egg and 1 fruit for breaking my fast today. These cookies contain everything in my plan and tasted like a healthy oatmeal cookie. I served mine with a dollop of low-fat Greek yogurt and pomegranate seeds. I found a few Paleo cookie recipes and this is a compilation of a few recipes that I found on the Internet. Some recipes use nut butters or flax seed instead of eggs to make them vegan. I saw a recipe with applesauce but none with apple chunks. I think you could experiment with the batter to make pancakes or waffles. Mash 1 ripe banana with a fork, add 1 cup of rolled or instant oats,1/2 cup of diced apple, 2 beaten eggs, 2 tablespoons chopped walnuts, a dash of cinnamon and salt. Combine and spoon batter into 6 mounds onto parchment paper. Bake for 17-20 minutes until slightly browned. This is two servings on the meal plan. One serving is 3 cookies fulfills 1/2 protein, 1 grain, 1 fruit and 1 fat portion. I used yogurt for extra protein and pomegranate because they were pretty. If you aren’t on a reduced calorie plan you could eat these with a nut butter, agave syrup or more fruit. A Sunday splurge that is on my real, whole food plan. No sugar required. I’m sugar free today! Made these tonight. They were fabulous! I made them with roasted sweet potato today without the banana. They were good but not as sweet.